Originally published in, The PCB Design Magazine, April 2013 issue. By definition, a guard trace is a trace routed coplanar between an aggressor line and a victim line. There has always been an argument on whether to use guard traces in high-speed digital and mixed signal applications to reduce the noise coupled from an aggressor transmission line to a victim transmission line. On one side of the debate, the argument is that the guard trace should be shorted to ground at regular intervals along its length using stitching vias spaced at 1/10th of a wavelength of the highest frequency component of the aggressor’s signal. By doing so, it is believed the guard trace will act as a shield between the aggressor and victim traces. On the other side, merely separating the victim trace to at least three times the line width from the aggressor is good enough. The reasoning here is that crosstalk falls off rapidly with increased spacing anyways, and by adding a guard trace, you will already have at least three times the trace separation to fit it in. In our DesignCon2013 paper titled, “Dramatic Noise Reduction using Guard Traces with Optimized Shorting Vias”, I coauthored along with Eric Bogatin, we showed that sometimes guard traces were effective, and sometime they were not; depending on how the guard trace was terminated. By correct management of the ends of the guard trace, we demonstrated it can reduce coupled noise on a victim line by an order of magnitude over not having the guard trace present. But if the guard trace was not optimized, the noise on the victim line can also be larger with the guard trace, than without. We started out the investigation by building circuit models for the topologies studied. Agilent’s EEsof EDS ADS software was used exclusively to model and simulate both stripline and microstrip configurations. The generic circuit model, with a guard trace, is shown in the top half of Figure 1. The circuit model, without a guard trace, is shown in the bottom half. For the analysis, we used lossless transmission line models. The guard trace length was exactly matched to the coupled length. The ground stitching and the end-termination resistors, on the guard trace, could be deactivated, and/or shorted, as required. The line-width space geometry was set at 5-5-5 mils, and the spacing for the non-guarded topologies was set to three times the line width. Figure 1 ADS schematic for generic topologies with a guard trace (top) and without (bottom). The transmission line were segmented and parameterized to easily change the lengths as required. The ground stitching and the end-termination resistors, shown in top schematic, can be deactivated and/or shorted as required. Figure 2 is a summary of results when a guard trace was terminated in the characteristic impedance, left open, or shorted to ground at each end. The red waveforms are the results for topologies without a guard trace, and the blue waveforms are with a guard trace. Depending on the nature of the termination, the reinfected noise on the guard trace can add or subtract to the directly coupled noise on the victim line. This often makes the net noise on the victim line worse than without a guard trace. Unlike a simple two-line coupled model, where the near end crosstalk (NEXT) and far end crosstalk (FEXT) can be easily predicted from the RLGC matrix elements, trying to predict the same for a three-line coupled model is more difficult. Manually keeping track of all the noise induced on the guard trace, and its reinfection onto the victim line, is extremely tedious. First you must identify the directly coupled reinfected backward and forward noise on the victim line from the voltage on the guard trace. Then the problem is keeping track of the multiple reflections of the noise on the guard trace. Because of this, the only real way to analyse the effect is through circuit modeling and simulation. In microstrip topologies, as you can see, there is little to no benefit to adding a guard trace; regardless of how the ends are terminated. 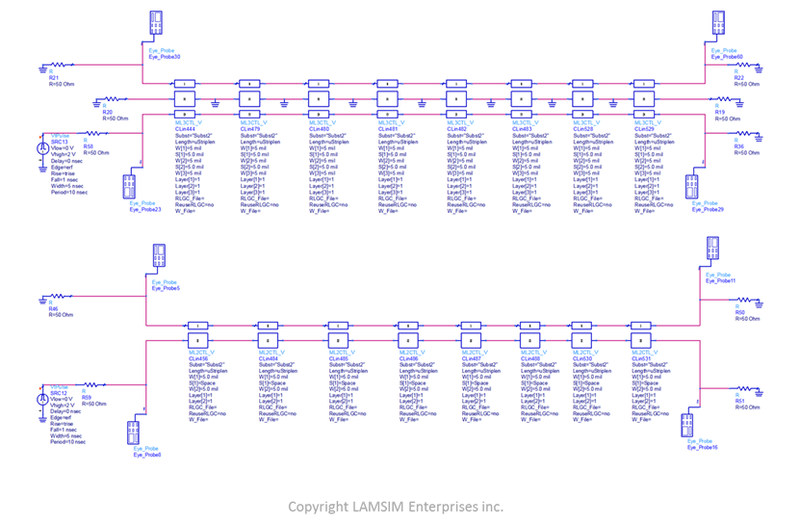 This is because microstrip topologies are inherently prone to far end crosstalk. Therefore any far end noise, coupled onto the guard trace, will subsequently reinfect the victim with additional far end noise; as seen by the additional ringing superimposed on the blue waveform. In stripline topologies, without a guard trace, there is no far-end cross talk generated. But when a guard trace is added, and depending on how the ends are terminated, any near end coupled noise on the guard trace can reinfect the victim. It is only when the ends are shorted to ground we see such a dramatic reduction of both near and far end noise. Figure 2 Summary of simulation results when the ends of the guard trace was terminated, left open or shorted to ground for microstrip and stripline geometries. When practically implementing a guard trace, to act as a shield, a rough rule of thumb suggests the spacing of shorting vias should be at least 1/10 the wavelength of the highest frequency content of the signal. For a risetime of 100 psec, the stitching via spacing, to meet l/10, is 0.18 inches; or 9 stitching vias over 1.5 inches. Figure 3 summarizes the results when a guard trace was stitched to ground at multiple wavelengths; compared to the case of no guard. As you can see, in the case of microstrip, when the guard trace is shorted with fewer than 9 vias, there is still considerable ringing noise on the guard trace which can reinfect the victim line. But in the case of stripline, having two shorting vias at each end, or any number up to 9 shorting vias has the same result. 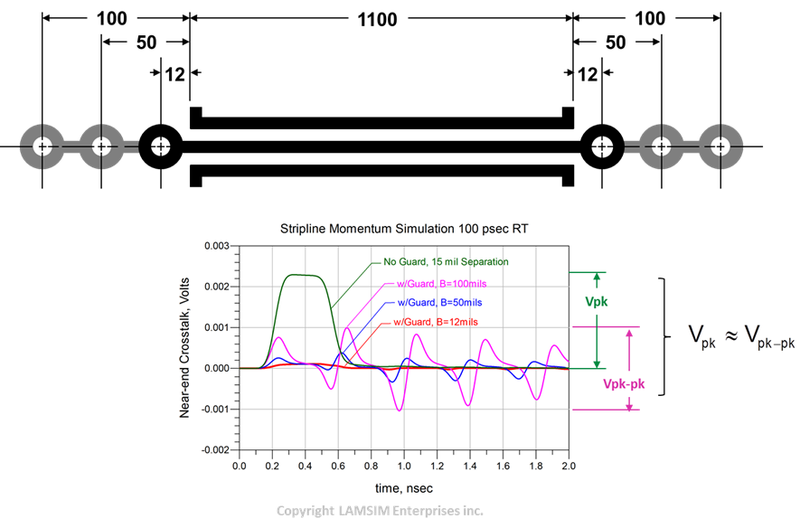 This suggests there is no need for multiple shorting vias, other than at the end of the guard trace; as long as the guard trace is the same length as the coupled length. This dramatically simplifies the use of guard traces in stripline. 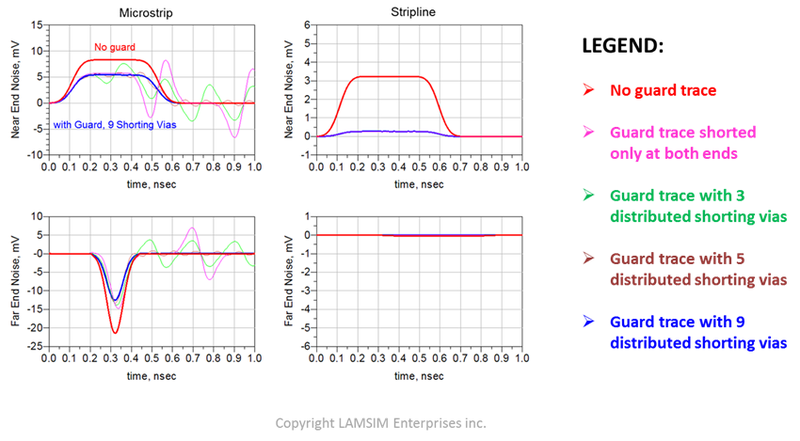 Figure 3 Summary of simulation results with guard trace stitched for microstrip and stripline geometries. Up until now we have modeled and simulated ideal cases of shorting the guard traces to ground. But in reality, there are additional practical design considerations to consider. First is via size, and the impact it has on the line to line spacing. Next is the finite via inductance; since its impedance will prevent complete suppression of the noise on the guard trace. And finally, the extension of the guard trace compared to the coupled length. 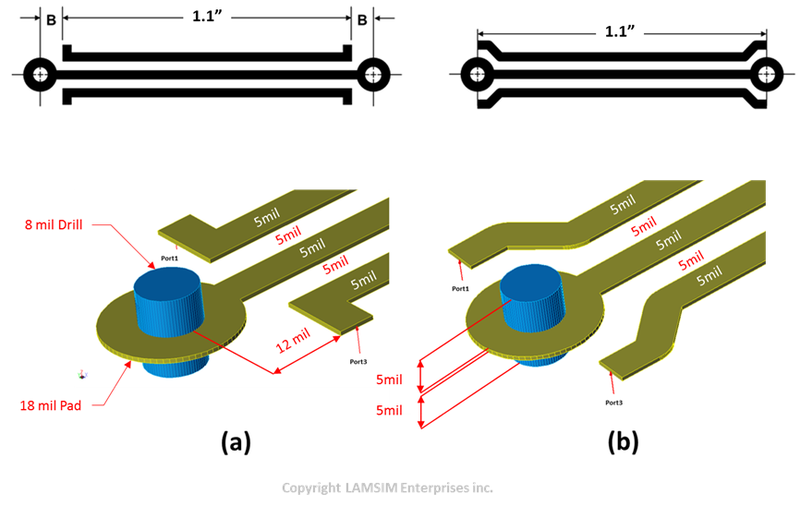 Because through hole manufacturing design rules limit the smallest via and capture pads, the smallest mechanical drill size most PCB vendors will spec is 8 mils. By the time you factor in the minimum pad diameter and pad to copper spacing, the minimum space between the aggressor and victim lines would have to be at least 28 mils, as shown in Figure 4; just to fit a guard trace with grounding vias down its length. At this point, you have to ask yourself if it is even worth it; especially for microstrip topologies. If the two signal lines were to be increased to 28 mils, the reduction in cross talk from just the added separation would likely be more significant than adding the shorted guard trace. Figure 4 Minimum track to track spacing to fit an 8 mil drilled via and pad in through-hole technology. Fortunately, the circuit analysis has shown there is little benefit to adding a guard trace to microstrip topologies, even if it was ground stitched appropriately. But to gain a dramatic reduction in cross talk in stripline all that is required is to short the guard trace at each end, and ensure the guard trace is exactly the same length as the coupled length. This means the minimum space to fit a via and guard trace can remain at three times the line width; as long as the guard trace is extended slightly, as shown in Figure 5(a). Alternatively, the guard trace can be made equal to the coupled length, as illustrated in Figure 5(b). Agilent’s ADS Momentum planar 3D field solver was used to explore and quantify the implications vias and guard trace lengths have on noise reinfection. Figure 5 details a portion of the 3D model on the left end of the respective topologies. The right hand sides are identical. The reference planes are not shown for clarity. Figure 5 Two examples of adding a grounded guard trace with minimum spacing of 3 x line width. Figure (a): guard trace is extended past the coupled length (A) by dimension B on both sides in order to satisfy minimum 5 mil pad-track spacing requirements. Figure (b): guard trace is equal to coupled length by separating the traces at each ends. Modeled in Agilent Momentum 3D field solver. Reference planes are not shown for clarity. 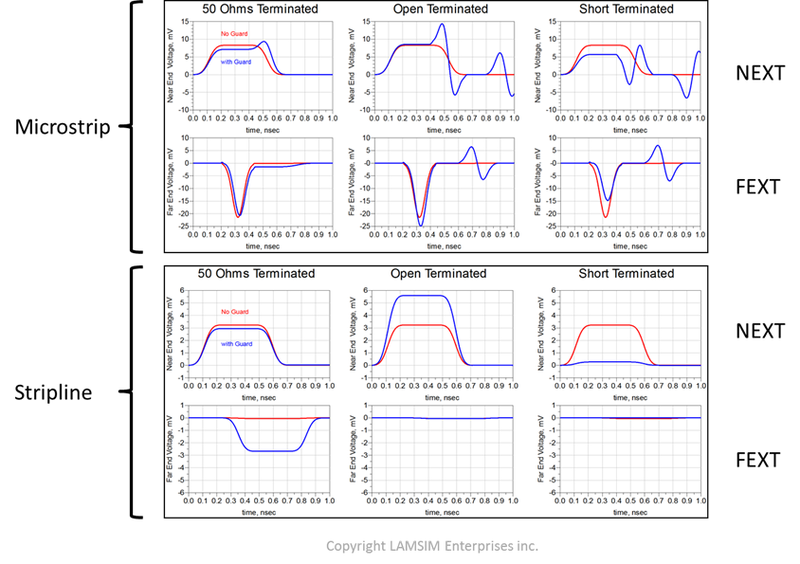 After simulation, the S-parameter data was saved in Touchstone format and brought into ADS for transient simulation analysis and comparison. Figure 6 shows the results. The plot on the left used 100 psec risetime for the step edge, while the plot on the right used 50 psec. Both plots are consistent with the dramatic noise reduction observed in Figure 2, except here we see some added noise ripple after about 0.8 nsec. At 100 psec risetime, there is effectively no difference in near end noise signature for either (a) or (b) topology. But when the risetime was reduced to 50 psec, the noise ripple is more pronounced. The blue waveform shows that even when dimension B is 0 mils, there is still a small amount of noise due to the inductive length of the vias to the reference plane. The red waveform shows that adding just 12 mils to the guard trace length, at each end, the ripple magnitude is almost doubled. It is a well-known fact that technology advancements over time results in faster and faster rise times. If you have engineered your design on the technology of the day, any future substitution of parts, with faster rise time, may cause your product to fail, or worse be intermittent. Figure 6 Momentum transient simulation results comparing near end crosstalk at Port 1 when aggressor voltage was applied to Port 3. The red and blue waveforms are with a guard trace. The green waveform is with no guard and 15 mils separation. Aggressor voltage = 1V, 100 psec risetime (left) and 50 psec risetime(right)..
To explore this phenomenon, the guard trace was varied by 50 and 100 mils at each end, as illustrated in Figure 7. Here we can see that as the guard trace gets longer at each end, the noise ripple grows in magnitude quite rapidly. It is remarkable to note that when the guard trace is just 100 mils longer, at each end, the peak-peak amplitude of the noise just about equals the peak magnitude of the no guard case. Figure 7 Momentum transient simulation results with guard trace extended. B = 12 mils (red), B = 50 mils (blue) and B = 100 mils (magenta) compared to no guard (green). Aggressor voltage = 1V, 100 psec risetime. Dimensions in mils. When the guard trace was removed, and the space was increased to five times the line width, the near end crosstalk was reduced in magnitude and was approximately equal to the guard trace scenario, as seen in Figure 8. Furthermore, because there is no guard trace, there is no additional noise ripple. Figure 8 Momentum transient simulation results comparing near end crosstalk at Port 1 when aggressor voltage was applied to Port 3. Aggressor voltage = 1V, 100 psec risetime. So getting back to the original question, “Are guard traces worth it?” You be the judge. Using a guard trace, shorted at each end, can be effective, if you need the isolation. But it does have caveats. If you decide to go down this path, it is imperative for you to model and simulate your topology, preferably with a 3D field solver, before signing off on the design. Eric Bogatin, Bert Simonovich,“Dramatic Noise Reduction using Guard Traces with Optimized Shorting Vias”, DesignCon2013, Santa Clara, CA, USA, Jan 28-31, 2013.